Do you have an iPhone 6 or 6 Plus and having problem with the touch? Do you have those GREY BARS appearing at the top of your screen? Have you noticed over time that it freezes up when being used or sometimes will stop responding to your finger presses entirely until you restart the phone or it randomly decides to start working again all the while you’re hissing and calling it names and vowing to take vengeance upon its little iPhone children? This is a common issue and is referred to by the repair community as Touch IC Disease. First diagnosed in the United States, like any disease it spreads but there is no vaccine, there is however a cure and that cure is A One Mobiles and Repairs! The problem is one that can be tricky to diagnose, a lot of screen replacement shops will simply assume the digitiser (touch sensing portion of the display) is at fault and replace the display, but this will not fix the issue. One way to know, is the appearance of GREY BARS along the top of your iPhones display. In reality, if you have touch IC Disease, it is actually a problem with having fractured pads that connect to your ic which no longer communicate. Sometimes just replacing your ic will not fix it and you will need to run a jumper wire on that line before the new ic is replaced, this is known as the M1 jumper. There are two of these chips that control your touch functionality. The U2402 Meson chip and the Cumulus U2401, both of these IC chips need to be replaced. 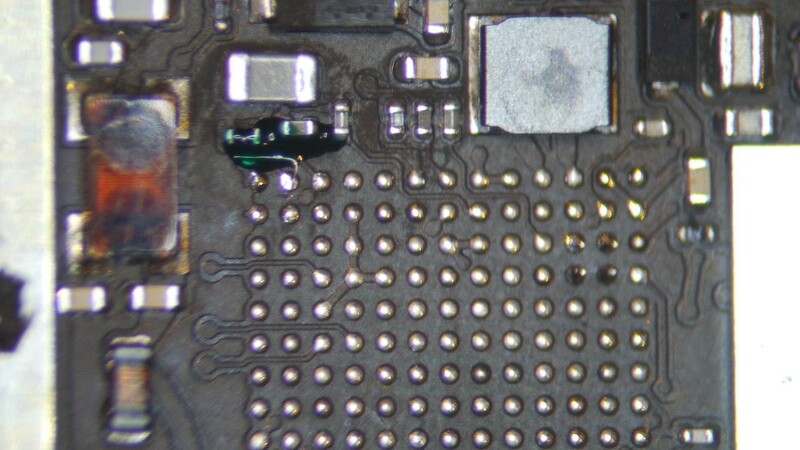 Take note though, replacing these chips is the only correct way of repairing this problem as there are repairers that will simply reheat the chips to get them to reconnect again this procedure will only be a temporary fix and is not recommended. This is a very delicate repair and we leave these sorts of jobs to our most experienced technicians, because under these chips are many little solder balls (pads)that make connection to the motherboard, the reason you have lost touch is that one or more of these balls have dried out and fractured, corroded due to various elements or simply due to having a bend in your phone. Apple’s repair Geniuses aren’t equipped to make specialized repairs to the logic board in-house, so they can’t actually fix Touch IC Disease, if you have your phone under the warranty period they will advise that you have them replace your phone, though this doesn’t guarantee another iPhone 6 won’t manifest the same issues. So what do you do if your iPhone is not covered by Apple warranty, or you don’t want to give them your precious device and have them wipe it and send you a blank, probably refurbished iPhone. You bring it to the experts at the nearest iPhone Centre for Touch Disease Control, A One Mobiles and Repairs! We are equipped with high tech Microscopes and soldering equipment to carry out the precision work required to do this procedure correctly and with a lasting finish. We will remove these chips entirely and replace them with new ones and run an M1 jumper. We then test your phone for a period of time to make sure that the problem will not arise again and that all components are working up to our high standards. We also recommend that you have your phone backed up and Find my iPhone and iCloud are turned off before you bring the phone into us, if you cant get any response from the phone to do this we will try to help out in store. Also read: How to To Hard Reset Your Samsung Android?